Construction of two apartment buildings containing a combined 45 units. Since 1835, Bank of Canton has provided land developers and real estate firms with the means to grow and prosper throughout the Greater Boston area. We understand our local markets better than anyone. And we’re ready to put our expertise to work for you. Let’s talk about your next commercial project. Financing for two-unit condominium conversion. SBA 504 mortgage loan financing purchase of owner-occupied, 30,000 SF office building. Acquisition of a property and construction of a new home for resale. Purchase and renovation loan for new flex headquarters building. Construction financing of a new single-family rental property. Construction loan to finance development of new 13-unit condominium building. Purchase and construction financing for three-house subdivision. Refinance of nine-unit apartment building. New construction of two single-family homes. Mortgage loan to finance portfolio of properties including an owner-occupied car wash property and office buildings. Acquisition/construction loan to purchase existing three-family home and convert it into residential condominiums for resale. Acquisition/construction loan to purchase existing single-family home, for tear down and new construction for resale. Commercial mortgage loan to finance acquisition of seven-unit apartment building. Purchase financing for five-unit apartment building. Construction loan to finance development of a three-unit condominium conversion. New construction of a single-family home for resale. 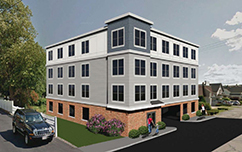 New construction loan for 18-unit apartment building. Mortgage loan financing improvements for a well-established yacht club/marina operation.